click, hosted power counter: Make a run. Avoid all tags for the remainder of the run. Oh, man I hope this card starts seeing play. Laughs at Data Raven, which is especially helpful post Data as Destiny and Keegan Lane is going to be causing headaches. So is Quantum Predictive Model behind something like a 6 strength Gutenberg on R&D. Casting Call never took off, but it also ends those shenanigans. Also lets you keeps the pain away from News Team, totally turning it off, providing you manage to hit it with one of the 4 runs (low odds). Of course you can only run 4 times with this, and you have to click it to run, so it doesn't work with The Maker's Eye or Legwork runs, something that New Angeles City Hall would be better for, and that card also works outside of a run, which also lets you avoid 24/7 News Cycle into Breaking News. Dorm computer doesn't stop SEA Source or Midseason Replacements either which is huge. Minor pros are that it lets you avoid Enhanced Login Protocol, and helps against Argus Security: Protection Guaranteed as well, so it's not totally useless out of the NBN matchup. Extra points for excellent flavour. 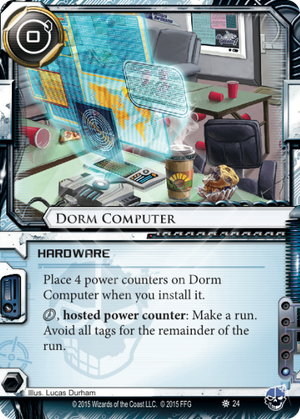 You're using a dorm computer so it's really hard for the corp to know who you are, but you can't do it too often or they get wise (or you get b& from the dorm). And they were playing beer pong in the background! I like this card, btw, if that wasn't obvious. You can make the corp underestimate you by installing it confidently turn 1. You may want to play a single copy if your meta plays RP with ELP and Buchershops. By the way, I'm not sure if you can avoid taking a tag with this when stealing an agenda to Argus. Can somebody confirm that? Thanks for the information about Dorm Computer of this I am happy with this that's why I am here sometimes I have an 0xe8000015) issue and find the support was not found and its more important knowledge about how to get the situation of this.